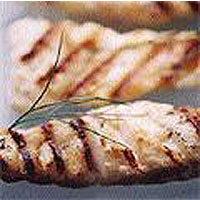 Cut the fish into thick strips and brush with vegetable oil and mirin or cooking wine. Brush the peach halves with oil and sprinkle with salt. Put the peaches on the barbecue, cut side down and cook for 7-8 minutes until golden. At the same time, cook the fish on the barbecue for 2-3 minutes each side until tender. Meanwhile, squeeze the juice from the limes, then hollow out the lime halves. Fill these with equal quantities of soy sauce and the freshly squeezed lime juice for dipping. Serve the fish, peaches and dip straight away, alongside the ceviche, but on separate plates.